Below is another instance of notification -- in fact, the EIGHTEENTH KNOWN VICTIM . . . and there are obviously MANY more. I have been doing some investigation on my own as to a person I have been talking to that is claiming that her, and several other girls are being held against their will in an unknown location (to them). The girl is not asking for money but asking me to find her help. She is only able to use the dial up internet access and is not able to contact authorities via her connection due to software on her computer disabling certain sites and features. I informed her that if police were involved that if this was a joke that she would be in trouble. She was not hesitant to help me figure out her location via any means possible. The only reason I am writing you about this is because I have reported this to the Polaris Project (National Group for Human Trafficking and Sexual Slavery) that these girls are held against their will and forced to do pornographic films. 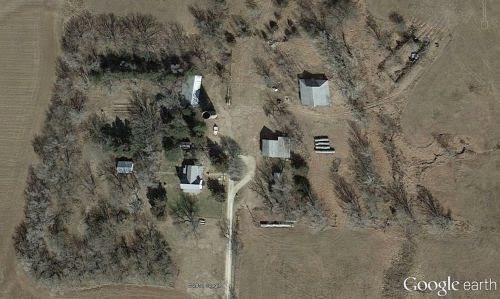 Her IP address shows that the IP is logged on in between 8636-8692 NW 120th St. Potwin, KS 67123 in which the address on the MSGate blog shows the address of 8653, being perfect for such as I have seen he aerial photos of the residence. She described one male who is in the building regularly as being approximately 40 years old, also signifying the James Arnold supposedly living there showing up as between 40-44 years old in his public profile. She gladly cooperated in helping me track her IP address and it said she was using AOL to log on. She told me that was correct. I need ANY information you have about this residence so I can complete a profile for this case for them as they need reasonable proof that there is no residential activity going on there before making an investigation. I see no reason for someone to hack an AOL account in their own home. Please email me back ASAP so I can help this case get solved. Thank you for reading this.